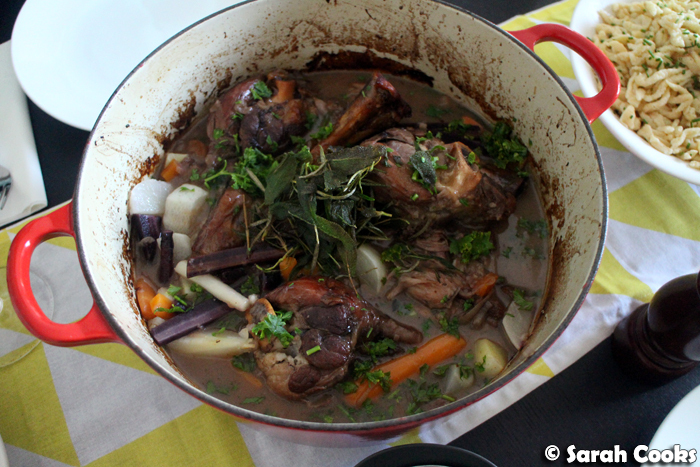 Sarah Cooks: A Springtime Dinner Party! It's been a long time since I've done a dinner party post, hasn't it? (Last time was that Eggplant Parmigiana Dinner Party, back in March, for anyone following along at home). Well, I'm very pleased to be sharing with you this lovely Spring dinner we hosted recently for the lovely Food Trail family! We'd been looking for an excuse to crack open the 2006 Henschke Hill of Roses wine that I splurged on at the Henschke Cellar Door when we were in the Barossa Valley. For any wine geeks out there... the Hill of Roses was produced from a small selection of low-yielding dry-grown shiraz vines from the Hill of Grace vineyard, that were only twenty years old and too young to be considered for inclusion in Henschke's flagship Hill of Grace. However, the grapes from this selection ended up producing a wine that was so good that Henschke bottled it separately and did a limited release. Ta-dah! I thought a slightly luxe menu would suit the special wine, and here's what we came up with. I knew that the Food Trails would be bringing a 2010 Clonakilla Viognier (love that wine! ), so I wanted to make an easy starter that would match. 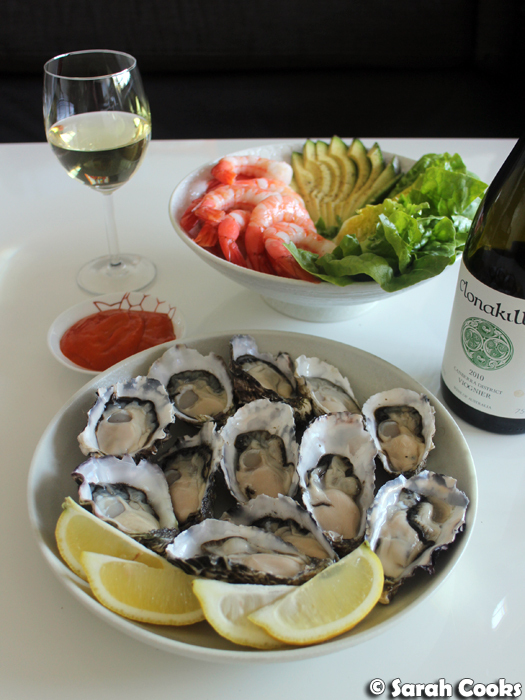 A dozen Coffin Bay oysters and a lazy prawn cocktail did the trick. 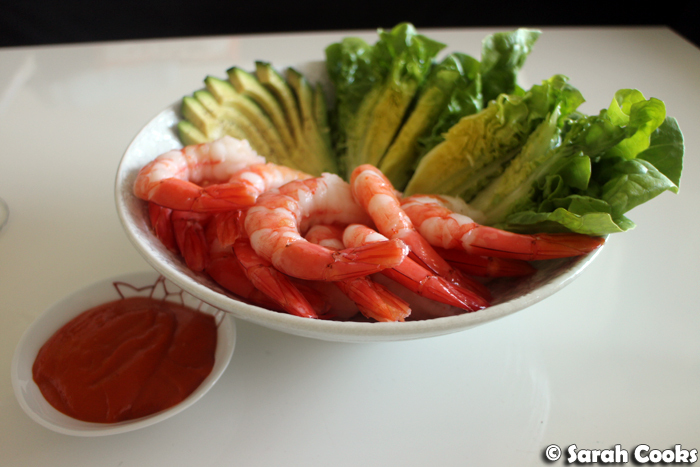 I bought a dozen peeled and cooked prawns, and put them in a pretty bowl with some sliced avocado and baby cos lettuce wedges and (store-bought) cocktail sauce. Boom boom. Remembering that the Hill of Roses that we tasted at Henschke both had lovely, herbal aromas and flavours, I thought that a herby lamb stew would complement the wine well. I chose Mary Berry's lamb fore shanks with English vegetables, adding fried sage and rosemary on top. It looked messy but tasted fantastic! 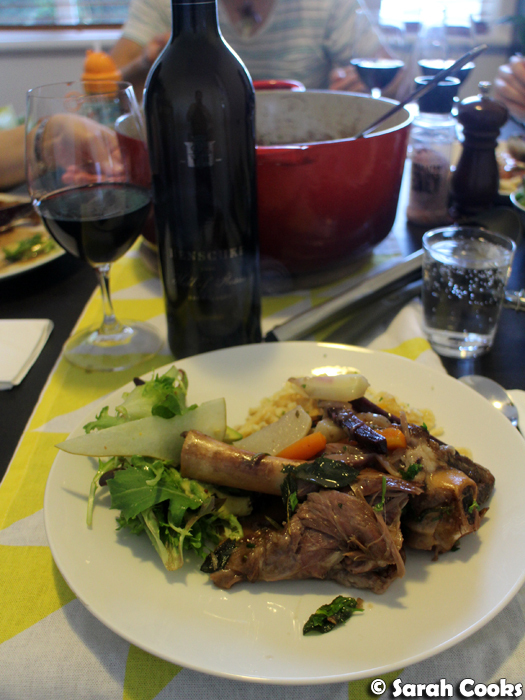 I'd bought the lamb shanks from the Boroondara Farmers market and they were super melty and flavourful. PS I love Mary Berry! Her show is great and her recipes work so well! 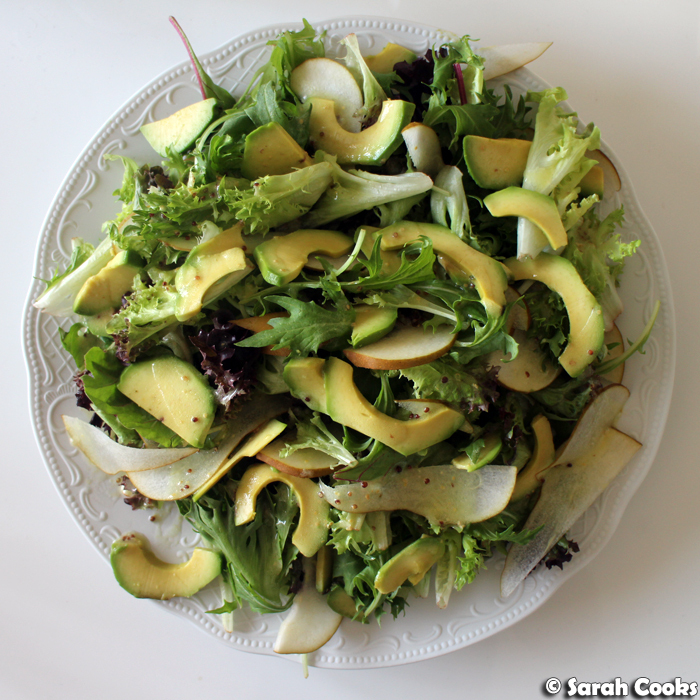 This side salad was another Barossa-inspired item - a salad of soft leaves, avocado, pear with a mustard and sunflower dressing (this was the same dressing we enjoyed at Appellation). As for the choice of carb - Sandra and I have been going Spätzle-crazy ever since our Spätzle-press arrived in the mail. Spätzle all the time! Sandra made this glorious mountain of Spätzle, tossed in brown butter and sprinkled with chives. 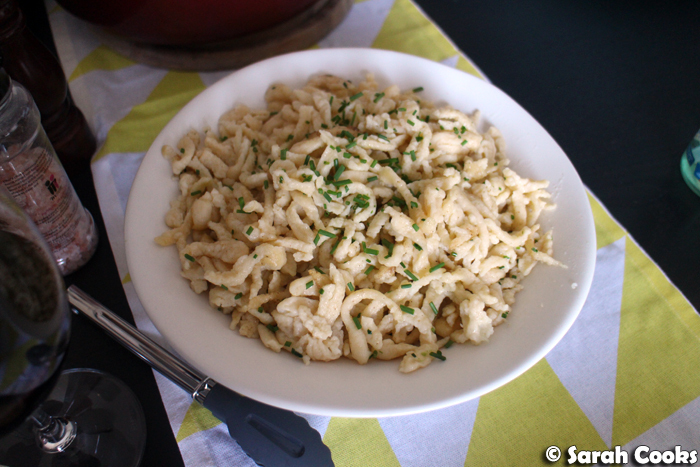 And yes, Spätzle-recipe coming your way soon! Dessert! I figured we'd be full after all that stew and Spätzle, so I just wanted to make a little something something sweet to end the meal. 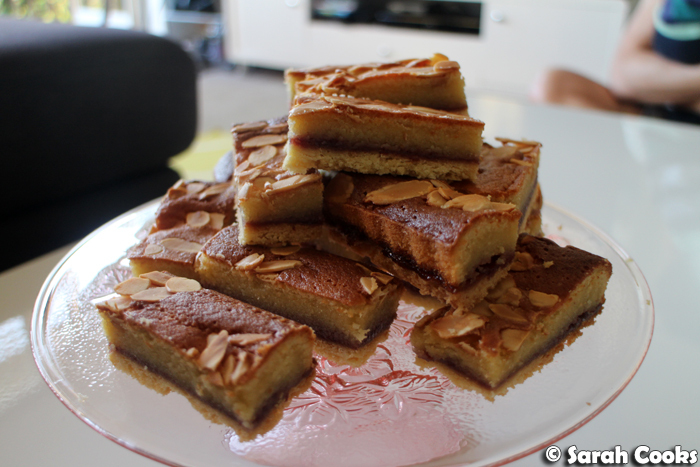 Nigella's raspberry Bakewell slice fit the bill - it's a shortbread base, topped with raspberry jam and a frangipane mixture. So buttery! (I made this last time five years ago to follow a roast beef - can't believe it's been so long between outings!) Not pictured, but definitely eaten, was some super rich, super thick double cream to go with. Lush! 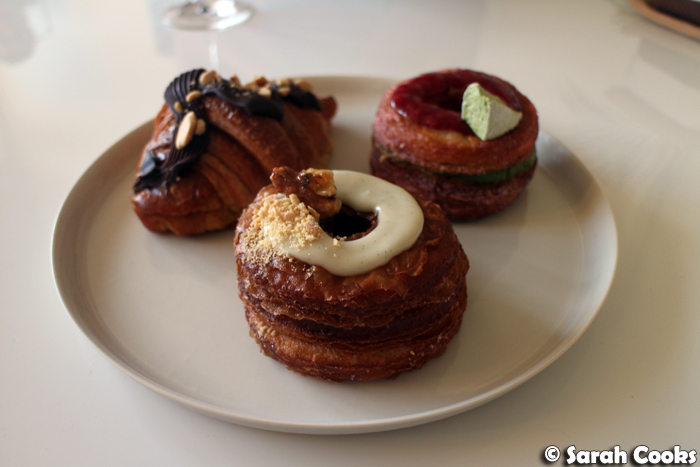 And speaking of decadence, April also brought along these delicious pastries from Rustica Sourdough - a matcha cronut, a vanilla cronut, and a peanut butter chocolate croissant! Cronuts may be the more fashionable pastry, but I gotta say, that peanut butter chocolate croissant was my favourite of the three! Thank-you to the lovely Food Trails for enjoying a fun afternoon with us! (And for all dem pastries!) Can't wait till next time!